This post is slightly late (5 days) but so is the commemorative issue (2 years late). On Thursday, 24th April 2008, the Post Office issued the first of this year's commemorative stamps. This issue is to celebrate 100 years of moving Brunei's capital to dryland. Prior to 1906, Brunei's capital or administrative centre was always on the water. Though reading some of the older books, it may have been that the palace was not always on water, but tre rest of the administrative capital was always on the water. The government persuaded a group of Pengirans to move out to dry land and to build their houses in the Tumasek area. His Majesty Sultan Muhammad Jamalul Alam built the first Istana on dry land in 1909. This was followed by some of the populace who started to build their houses in the Kianggeh and Sumbiling areas. A group of Chinese businessmen moved out from Kampung Pekan Lama (then known as Kampung Bakut China) which served as the business area in Kampong Ayer, and started to build their shops on dry land. In 1910, there were six shops, the year after, in 1911, there were 26 shops and just before the Second World War in 1941, that number has increased to more than 80 shops. The shops are built along the current Jalan Sultan. As for the population, it was not only in Kianggeh and Sumbiling, but they have also moved to Sultan Lama, Barangan, Sungai Kedayan, Tasik, Tungkadeh and Pusar Ulak. Although there were a number of houses now built on those areas, there were still many more left on Kampong Ayer. The Post Office was quite innovative this year compared with other previous issues. You can buy the First Day cover with stamps, the miniature sheet of the four stamps, a sheet of 20 stamps for each stamp in a mounted frame and also a booklet of stamps. 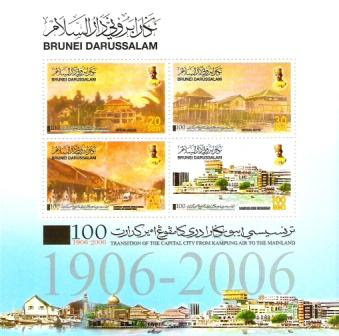 The stamps commemorated the beginning of modern Brunei and I think it is worthwhile to keep them. The stamps are available at the Philatelic Unit at the General Post Office, go there, get the stamps and visit the stamps gallery at the same time. You can see the earliest stamps of Brunei including that of the 1895 stamps. The stamps are issued in denomination of 20 cents, 30 cents, 60 cents and $1.00. The designer is Awang Abd Ajihis bin Haji Terawih. They are printed by Secura Singapore Pte Ltd through offset lithograph using 106 gsm yello green phosphor coated stamp paper with perforation of 13 per 2 cm. The stamps size are 30 mm x 48 mm. I received this from a philatelic friend in Lumut. 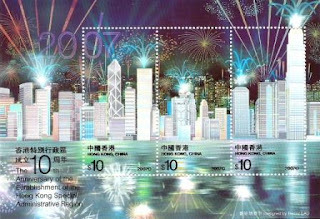 When I first got it, I did not realise this 2007 miniature sheet from Hong Kong celebrating the 10th anniversary of the Hong Kong Special Administrative Region in China (the British left Hong Kong in 1997) is actually a hologram miniature sheet. The scanned sheet does not do it justice. The 1997 transforms to 2007 and there are lots of fireworks visible as well. This is worth some US$6 on ebay. Thanks Hung! I managed to visit another philatelic dealer in Singapore. There was nothing in particular that I wanted, I did buy the lower values of Kelantan's Malaya-Borneo 1922 Exhibition stamps. I was quite surprised that I managed to get the 6 stamps for about $70 only. I also bought this 3 cents 1908 Brunei stamp with a postmark of 15th June 1908. This stamp was postmarked almost a hundred years ago. This 60 year old note is the Sabah's 50 cents paper note issued in 1938, just prior to the second World War. This paper note is interesting as most fractional (less than $1) notes were issued during the war itself. The Straits Settlement fractional notes were issued in 1940 and in 1941 (used in 1946). But the Sabah one is issued a couple of years earlier in 1938. 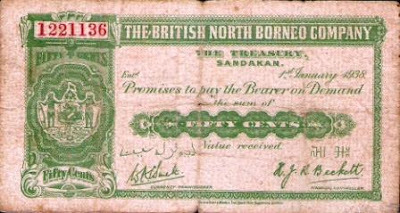 Metal must have been in shorter supply even before 1938 or the metal cost is so high that the North Borneo government felt that it was worthwhile to go to paper instead of minting metal coins. I got this from a German dealer for about US$200, a bit on the high side but I could not find this anymore.